← Today’s Watercolor: Hoppy Easter! mid-April, and I meant to have this up for it but the past couple weeks have been a little crazy. A few years ago we had the good fortune to be in Thailand during the festival, and it was amazing. I’ve been thinking a lot about that trip recently and how much fun it was. There were informal little water fights everywhere, and one day we went to the student area where there were hundreds, maybe thousands of people gathered. People had waterguns and giant buckets with big blocks of ice cooling down the water. The best part was walking down the long procession with your bowlful of powdered chalk (which quickly becomes mud) and rubbing the powder on each other’s faces. It was a hundred moments of incredible intimacy, touching a strangers face to gently rub this holy muck on their cheeks. Some people spiked their mud with cooling menthol, but it quickly washed off with all the water flowing (and flying) everywhere. We all made eye contact and wished each other a happy new year, later going home to wash the mud out of our hair and ears and every other surface it had gathered. That night we went out for Chinese food, freezing with our wet hair in the air conditioned restaurant and still finding specks of mud here and there and up our noses. Have you experienced Songkran? How does it compare to your New Year’s celebrations? And as always, what should I paint next? This entry was posted in Art and tagged Art, สงกรานต์, happy, I painted this, illustration, my art, New Year, songkran, thai, thailand, water, water festival, watercolor. Bookmark the permalink. 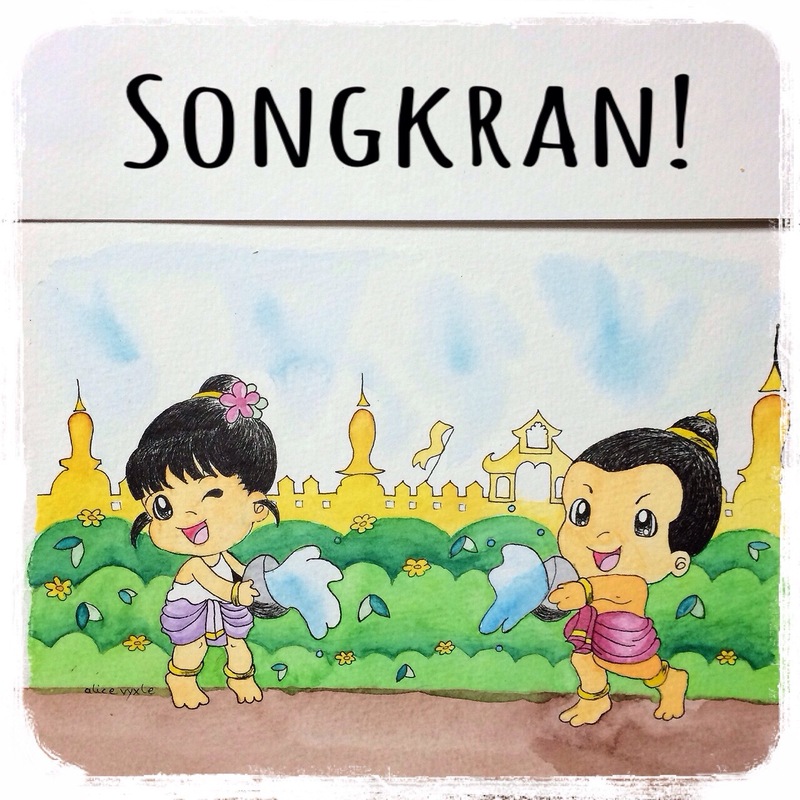 1 Response to Today’s Watercolor: Songkran! สงกรานต์! Beautiful painting Alice! What a fun way to cool off, sounds like games we used to play as children.